Women suits are conquering 2018, one season at a time. Women empowerment is a HUGE topic across all social, economic and political news, so it’s not a shock to me that these power suits are seen more and more! Women suits are NOT just a thing of corporate America! I am a pants type of girl! Don’t get me wrong, I love a flirty skirt, but to me there is nothing like a flared pant! MY friends all know, they even say they love my “androgynous” side. I’ve told myself time and time again I should branch out but it’s what I love. So to me the pant/suit trend isn’t new, but now there’s just so much variety and I couldn’t be happier! A lot of the time for events, I tend to opt out of wearing a dress and wear a pant suit instead. I personally love buying sets because I can throw them on together quickly or sale them separately! 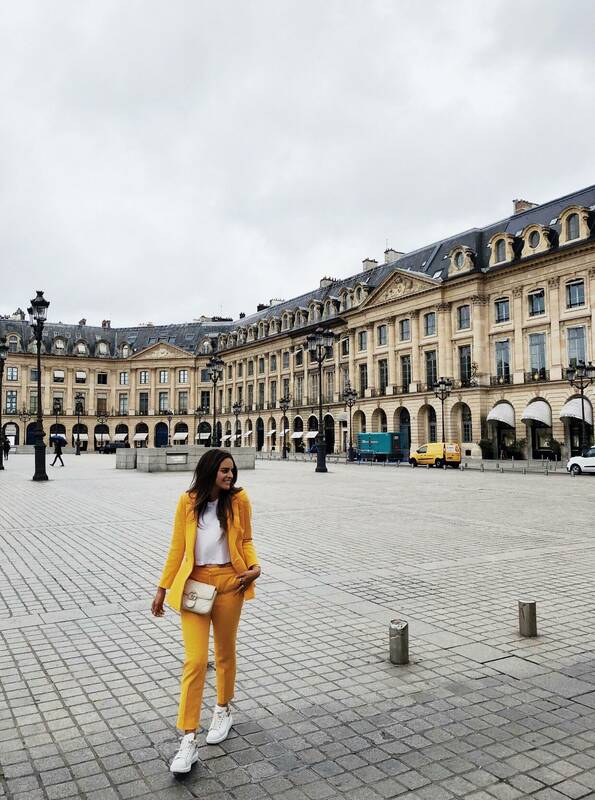 This past spring and summer, designers and fast fashion brands produced women suits in pastel pinks, bright yellows (like the one I am wearing), fun stripes, and so much more! They’re also offering more and more variety in their cuts to flatter women. The blazer I’m wearing in these photo from Zara is peplum! Now in the fall, the trend still crosses over but in thicker fabrics and neutral patters such as plaid, checkered neutrals, and even corduroy! Women are concurring the world in suits with comfy sneakers and I couldn’t hop on a trend any quicker! I wore mine around the beautiful streets of Paris with a cropped white tee and my white platform sneakers. Unfortunately, the exact one I’m wearing sold out. So below I listed some favorites and some that I just check out of my cart! Previous Post Sephora Beauty Insider Sale: See What I Ordered!